I usually try not to bring garden flowers in the house. They just don’t last long. Earlier this spring, I made myself a beautiful bouquet of fragrant, purple lilacs. Within minutes, my counter top was crawling with tiny black bugs. Yikes! I wasted no time getting that bouquet out on the porch. 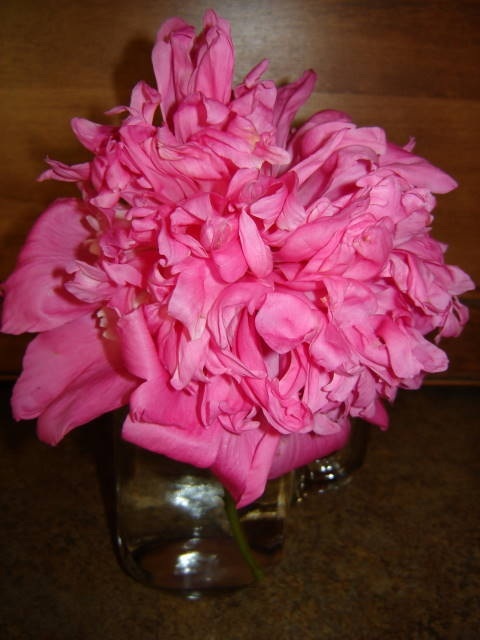 I carefully examined the peony before I even thought of cutting it. Not a bug! The flower pedals felt soft, cool, and somewhat squishy; in a good sort of way. I put it in a vase, placed it in my office, and forgot about it. I was immediately greeted by the gift of its fragrance later when I walked in my office. The entire room was filled with its glorious aroma. What a delight! This brought to mind a statement I heard at a ladies’ retreat, about twenty years before, that still sticks with me. The large auditorium was silent. I know everyone was thinking the same thing. “What do I leave behind?” We all want to leave the kind of fragrance that delights the senses. Isn’t that why people use perfume, cologne, aftershave and deodorant? The truth is we don’t always leave the delightful fragrance we desire. Sometimes, we leave a powerful stench that has nothing to do with our digestion. Lately, I have been thinking about the legacy I will leave behind when I am gone from this earth. I would like to think of it as a worthwhile fragrance for the next generation and that at the sound of my name, there would be pleasant thoughts. Well, I have to confess, I don’t believe that is what some will think of me. I have always been the kind of person who wants to be at peace with everyone, even before I knew this was a Bible verse. Unfortunately, there have been plenty of times I have left an odorous residue behind. Here’s one example. I used to be a poor apologizer. You know, “I am sorry, BUT…” Of course, I didn’t realize then that a but in the way sounds more like a BIG BUT and that’s all they hear of your apology. The BUT takes away the legitimacy of any apology. In the home I grew up, apologies were saved for those outside the family. This was long before the movie Love Story and its popular quote, “Love means never having to say you are sorry,” came out. Not that I necessarily agree with that statement. Eventually, I got the hang of what a real apology is. An apology with a BIG BUT in the middle is not an apology at all. It will be seen as an excuse each time. It does not matter how genuinely valid of a reason a person has for their offense or even if they didn’t even know they offended. Throwing that BUT in there, makes the apology sound like a cheap excuse. People just want to hear a genuine I am sorry, not a BIG BUT. Sometime ago, I had a legal matter to take care of for a deceased family member. I tried to do everything in my power to do the right thing. A certain family member (FM) deliberately held back information and behaved very cagily and secretively regarding this matter. Not knowing of FM’s cryptic relevant information, I proceeded with my legal responsibility. FM got angry at me, but chose to remain uninvolved and misinformed by not communicating with me; then made drastically absurd assumptions that I was doing something sneaky and underhanded to cheat them. I am willing to take the rap for mistakes I have made and want to own up to them. But, I am not willing to own up to things I have not done. I will however own up to some hurtful things I said to FM because of their strange and awkward behavior. It was a very emotionally raw time for both of us. People swing to extremes at the death of a loved one, and we weren’t any different. Later, I found out FM had their own clandestine agenda for not informing me of their knowledge of the deceased’s wishes. Now, FM refuses to talk to me or give me an opportunity to even discuss the situation with them. Instead, FM completely ignores my existence. At any of the rare encounters I have had with FM, I am confronted with an unfair and unreasonable amount of resistance and anger. Then there was a great deal of misunderstanding an disinformation floating around about this matter. Friends of the deceased went around making judgments with only partial information. Everyone fell under a shroud of secrecy, discussing things they didn’t completely understand. Gossip was birthed. I got dirty looks and heard of unkind comments, yet not one of those people came to me regarding the matter. Already traumatized by the tragedy of the death, I really struggled with this matter for a long time. I found myself coming to God over and over, ”Why Lord? When all I tried to do was to make sure everything was handled in the appropriate manner and that the deceased was honored and treated with respect?” I didn’t even want to deal with this legal matter in the first place, but it was placed in my hands by a judge. All this robbed my joy. It zapped my energy. Galatians 6:9 would echo back at me each time I came to the Lord. To this date nothing has gotten cleared up. FM still continues to live with their head stuck in the sand. What do you do in a situation when one, who has caused problems, refuses to see their part in it, entirely blames you, and refuses to give you an opportunity to talk to them? I know, it’s their problem, but still, it leaves one feeling accused and unresolved. I have forgiven FM, even though they caused me a great deal of unnecessary grief at such a vulnerable time in my life, and they continue to cause heartache. I finally had to rest in the comfort that God knows where my heart was then, and is now, and that is all that really matters. Thank goodness the deceased knows the truth! The flower is now dehydrating. Its pedals are not as supple, but the fragrance remains in even higher concentration. That is what I will strive to leave behind. A concentrated fragrance of God’s love and grace. Oh yes, I think most of us are guilty of apologizing with that BUT smack down in the middle of it all. Thank you for the good reminder. I really liked your thoughts about what we leave behind us and how you tied that to the peony. (By the way, ants seem to be very attracted to peonies, so you were fortunate you didn’t bring any of those critters into your home!) We have a row of peonies planted on one side of our deck and their beautiful fragrance wafts into our house when I have the deck door open. Wouldn’t it be wonderful if when people thought of us as believers, that lovely aroma enveloped them? As I look back in my life, I wish I would have left larger, puffy clouds of fragrance behind me rather than the anorexic poofs. I long to make a difference in whatever time the Good Lord has me on this earth. I do have some peonies with giant ants on them so, I know exactly what you mean. I transplanted that particular plant from another spot in the yard where it looked like it was dying, and that was my reward this year. I never knew their fragrance could be so amazing! Loved this! I’ll try to keep my “big but” to myself from now on. Me too! Aw! Bless your heart! Peaceful days are such a blessing! Yes, humility is right. Our family has been focusing on the “but” that is intended to absolve the offender of responsibility or lighten the load. It’s a tough one. It really is a tough one. We can narrow the difficulty down so it doesn’t seem so overwhelming, as all we can do is one day at a time. I’ve been guilty of saying this, “I’m sorry but …” I found that when I change my words to “Will you forgive me for …”, there’s no room for any buts. It does take an extra dose of humility to say it that way. It really does take a chunk of humility! I learned that the hard way. I like the way you put it, “there’s no room for any buts”. Our focus goes off us, trying to excuse ourselves, and the plea goes back on the person wronged, and nine times out of ten, they will melt at the request.